Mandeville is a small city in St. Start off your visit on the 30th (Thu): hike along Mandeville Trailhead Cultural Interpretive Center, then tour the pleasant surroundings at Tammany Trace, and then examine the collection at Smith H J & Sons General Store and Museum. To find traveler tips and more tourist information, go to the Mandeville trip planner . New Orleans to Mandeville is an approximately 1-hour car ride. When traveling from New Orleans in May, plan for somewhat warmer days and slightly colder nights in Mandeville: temperatures range from 83°F by day to 62°F at night. Finish up your sightseeing early on the 30th (Thu) so you can travel to Shreveport. Shreveport is the third-largest city in the state of Louisiana and the 113th-largest city in the United States. On the 31st (Fri), try to win big at Harrah's Louisiana Downs, take in the architecture and atmosphere at Cathedral of St. John Berchmans, and then try your luck at Margaritaville Resort Casino. To see reviews, other places to visit, ratings, and tourist information, read Shreveport trip itinerary maker app . You can drive from Mandeville to Shreveport in 5 hours. Another option is to fly. In May, daytime highs in Shreveport are 82°F, while nighttime lows are 63°F. Wrap up your sightseeing on the 31st (Fri) to allow time to travel to Dallas. Kick off your visit on the 1st (Sat): meet the residents at Dallas World Aquarium and then get your game on at The Escape Game Dallas. To find where to stay, photos, maps, and other tourist information, you can read our Dallas trip itinerary maker website . Getting from Shreveport to Dallas by car takes about 3 hours. In May, daily temperatures in Dallas can reach 83°F, while at night they dip to 65°F. Finish your sightseeing early on the 1st (Sat) so you can travel to Amarillo. Start off your visit on the 2nd (Sun): don't miss a visit to Cadillac Ranch, then see the interesting displays at Jack Sisemore Traveland RV Museum, and then admire all the interesting features of Cowgirls and Cowboys in the West. To see traveler tips, maps, where to stay, and more tourist information, read Amarillo trip itinerary builder site . Getting from Dallas to Amarillo by flight takes about 3 hours. Other options: drive; or take a bus. Traveling from Dallas in June, you can expect nighttime temperatures to be a bit cooler in Amarillo, with lows of 63°F. Wrap up your sightseeing on the 2nd (Sun) early enough to travel to Arches National Park. Kick off your visit on the 3rd (Mon): take in the dramatic natural features at Double Arch, then trek along Double Arch, then explore the striking landscape at Turret Arch, and finally make a trip to Delicate Arch. To find more things to do, traveler tips, reviews, and other tourist information, read Arches National Park trip itinerary builder . You can fly from Amarillo to Arches National Park in 5 hours. Alternatively, you can do a combination of flight and car; or drive. The time zone difference moving from Central Standard Time (CST) to Mountain Standard Time (MST) is minus 1 hour. In June, plan for daily highs up to 95°F, and evening lows to 61°F. Finish up your sightseeing early on the 3rd (Mon) so you can travel to Moose. Moose is an unincorporated community in Teton County, Wyoming, United States, in the Jackson Hole valley. 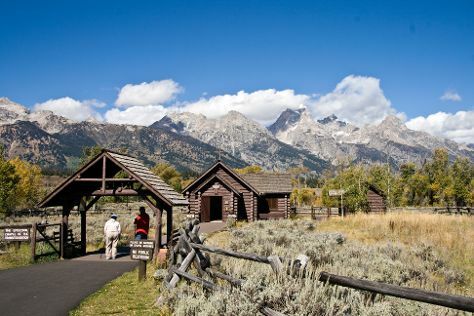 Start off your visit on the 4th (Tue): look for all kinds of wild species at Grand Teton. On the next day, snap pictures at Snake River Bridge, trek along Taggart Lake, and then appreciate the views at Amphitheater Lake. To see traveler tips, other places to visit, more things to do, and more tourist information, you can read our Moose visit website . You can drive from Arches National Park to Moose in 9 hours. Alternatively, you can fly. Traveling from Arches National Park in June, things will get cooler in Moose: highs are around 72°F and lows about 39°F. 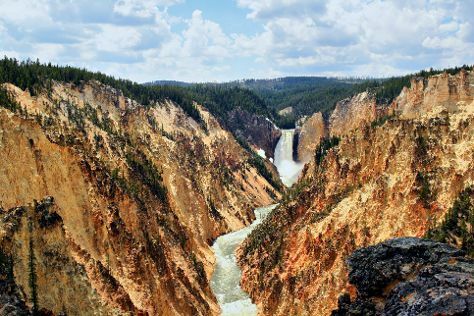 Cap off your sightseeing on the 5th (Wed) early enough to go by car to Yellowstone National Park. Start off your visit on the 6th (Thu): tour the pleasant surroundings at Artist Point, then take in breathtaking views at Grand Canyon of the Yellowstone, and then explore the wealth of natural beauty at Lake Butte Overlook. Here are some ideas for day two: witness a stunning natural landmark at Grand Prismatic Spring, then take in the natural beauty of Old Faithful, and then witness a stunning natural landmark at Upper Geyser Basin. For where to stay, reviews, ratings, and more tourist information, refer to the Yellowstone National Park itinerary planning website . You can drive from Moose to Yellowstone National Park in 2 hours. In June, Yellowstone National Park is a bit cooler than Moose - with highs of 66°F and lows of 34°F. Wrap up your sightseeing on the 7th (Fri) to allow time to travel to Keystone. You'll visit kid-friendly attractions like Black Hills National Forest and Big Thunder Gold Mine. Explore Keystone's surroundings by going to Custer (Peter Norbeck Visitors Center, Custer State Park, & more). And it doesn't end there: explore the striking landscape of Mount Rushmore National Memorial, take in the exciting artwork at Insideout, and stop by Granite Sports. To find reviews, where to stay, and other tourist information, refer to the Keystone trip itinerary planning website . You can do a combination of car and flight from Yellowstone National Park to Keystone in 6.5 hours. Alternatively, you can drive; or do a combination of car, bus, and shuttle. Prepare for somewhat warmer weather when traveling from Yellowstone National Park in June: high temperatures in Keystone hover around 73°F and lows are around 48°F. On the 10th (Mon), wrap the sightseeing up by early afternoon so you can travel back home.